*sigh* It was so close, and yet... no. It was good, i guess, but it was clear that Cameron Dokey had read Robin McKinley's "beauty" dozens of times. There is no rose. I liked that. The whole love-tree with a secret inside of it that only belle,the fabulous wood carver, can unlock... this was new and interesting. And, phew, the part in the boat (read it, you'll like that part) was really sweet. But there were so many moments where I just rolled my eyes. Either she had copied and pasted robin mckinley's masterpiece exactly or she had (quite obviously) done the exact exact opposite. Also, she didn't meet the beast until it was past halfway through the book. That's not okay. How can I fall in love? uh... erm... i mean, how can she fall in love... in just half of a book? It was okay, though. Read it anyways and see if you like it. I had mixed feelings about this book. For the first 140 pages, I was getting into the story. I enjoyed the good writing, the descriptions, I even liked all the characters. This was a nice version of "Beauty and the Beast" where Belle still had both her parents and even her sisters are kind and good. Nothing was really happening in the story. We were watching the main character grow up, which was somewhat boring but a little cool since she liked to carve wood and had a magical "gift" to see inside the wood to what it truly wanted to be shown...though we never got to see her do it more than once.At least...I trusted that this WAS "Beauty and the Beast" since the back cover said it was. For over 100 pages, though, there was no mention of a Beast or a forest or any other elements that would make this story even remotely connected to the famous fairy tale.Spoilers ahead...be warned:Finally, Belle's family's fortune takes a turn for the worse and they set off through the mysterious Forest and we hear that there may be a monster living in it. We also hear the story of a magical Heartwood Tree. Belle is intrigued by this story since she likes to carve wood. Belle and her family make it through safely and come out on the other side and start living a happy, well-adjusted life in a farmhouse in the country.Many more pages...nice interactions with her sisters...everyone is surprisingly making the adjustment from a rich, fashionable life to a quiet country life with no servants very well...ah, at page 130 or so, finally Belle's dad has an encounter with the Beast, which he tells to his family after the fact.Then at page 142, Belle goes to meet the Beast. Many pages are taken up with descriptions of what it's like to meet him. The Beast asks Belle to look into his eyes for the count of 5 "to free them both." She can't do it.He asks her to do this every day, and she can't. Why? No idea. She didn't ever even try, not once. There is no explanation of why this is impossible or even any description of how she feels about it except that she's frustrated that she has to tell him no. At first I thought this was a cool device, the look-into-my-eyes thing. Better than the traditional proposal question the Beast is supposed to ask every night, and more realistic. But since there was no explanation of why strong, confident, courageous Belle didn't even try to do this once, it soon fell flat and became meaningless.Belle and the Beast, during a mere 40 pages (not a lot because this is a very small book), have a couple of conversations. The rest of the time she wanders around on her own. Then one day, he lets her go home, just like that.While she's home, after a few days, she's feeling kind of depressed. She has a talk with the family friend, an adopted-grandfather type. Suddenly she realizes that she must love the Beast and she has to go back.Huh?? Where did that come from? It was totally out of left field. No warning, no indication. So she goes back and the Beast is dying and she looks in his eyes for the requisite 5 counts and tells him "don't leave me to love alone." The spell is broken (the spell that wasn't really satisfactorally explained at all) and he turns into a handsome young man. They get married and live happily ever after. And yes, all of this--her realizing she loves him, and going back to save him, and getting married and the end--takes ten pages. Talk about disappointment. The story described Belle's childhood, feelings, and growing-up years in such detail that I assumed we would get the gradual friendship and romance between her and the Beast with even more time, care, and attention...but no. It was a big let-down and made me not care about their fate at all. And the Heartwood Tree that was sounding like such a cool device and different twist turned out to be rather hokey, too, because it never said what Belle carved out of the branch or how the Beast even came to own that property with the tree on it. Very strange. You'd think after making such a big deal out of her "Gift" to "see" what each piece of wood really had inside and carve it, it would show the process of her and the Beast discovering it together. I felt kind of cheated out of their "relationship" and not getting to see how fear and loneliness turned to gradual friendship and then acceptance and then trust and then love. I am totally in "like" with this series. Why do I go all mushy inside every time I read one? I guess I carry way too much estrogen but I'm not ashamed. No way. Part of the reasons fairy tales have been around so long is because they show us something about what the heart can do.Belle doesn't fit her name. At least she doesn't feel like she does when she is next to her gorgeous sisters. The author doesn't make us feel sorry for Belle in the least, which I thought was odd but good. Though she isn't the beauty of the family she can carve wood. Her one true gift. And that gift is what brings her face to face with the beast and that's where the real story begins...In many parts of the book I felt that the imagery and the lines just seemed to fit and go perfectly for the age old tale of the Beauty and the Beast. From the heartwood to the water that could show you what your heart most wished for. Belle is honest and can't see the beauty she does possess, and the Beast, though as painful as a figure as he is, you end up understanding him more than you would have anticipated. Nice touch about the eyes of the Beast. Belle's family is wonderful. Needless to say I truly enjoyed it and in all reality the book has gotten a 4.5 star rating from me.You might be wondering why I used like instead of love. Well it's because of the rushed ending. I was excited to give this book 5 stars and talk about it to death, but then it ended way too fast. It gets too easy in the end for the protagonist each and every time. I know as readers we want to be spoiled from time to time, but I do wish to see more struggle and something that is fought hard for. It's not that the ending bothered me, but how fast everything goes once there is a resolution. The back story is always done superbly, but then it all gets hastily tied in a bow. I want the bow to be neater. Well enough with my metaphors. Even with my complaints do read the book to get a new take on this fairy tale. Like the previous Dokey book I read, Before Midnight, this book did a great job of establishing the main character's world and everyday life, but rushed the last act, which contains the actual fairytale that the book is supposed to retell.Pros1. I liked how Belle's mom was still alive and her sisters were actually nice to her.2. The lore of the Heartwood Tree was pretty intriguing (albeit resolved way too quickly), and Belle's talent for carving was refreshingly different. Too bad Dokey didn't use it that much.3. In this version, the Beast (view spoiler)[is not a prince, but a common huntsman who ran afoul of a good fairy in the Wood (hide spoiler)]. That was odd, but again refreshing.Cons1. The book spends barely any time in the Beast's castle, which was always my favorite part of this story.2. Belle spends the whole first half of the book whining about not being as drop-dead gorgeous as her sisters. It got old. By about page three. And even she admitted that she wasn't bad-looking, so what was the big deal?ConclusionThis retelling of "Beauty and the Beast" doesn't bring many new ideas to the table, but it's still pleasant. A short, squeaky-clean book that's great for young teen girls. SUMMARY: Belle is convinced she has the wrong name, as she lacks her sisters' awe-inspiring beauty. So she withdraws from society, devoting her time to wood carving. Secretly, Belle longs to find the fabled Heartwood Tree. If carved by the right hands, the Heartwood will reveal the face of one's true love. During a fierce storm, Belle's father stumbles upon the mysterious Heartwood -- and encounters a terrifying and lonely Beast. Now Belle must carve the Heartwood to save her father, and learn to see not with the eyes of her mind, but with the eyes of her heart.REVIEW: The story of "Beauty and the Beast" is one of my very favorites. This book, in turn, is one of my favorites so far in the Once Upon a Fairy Tale series. The beginning half was a bit slow and the continuous whining of Belle about her "beautiful sisters" and lamenting her own plain looks felt a little cumbersome. Once the Beast enters though the story becomes much more interesting. Cameron Dokey's books in this series seem to have more depth and a more definite lesson or moral in them which makes them more endearing to me. She keeps the focus on the main plot without a lot of unnecessary side plots which helps to strengthen the lesson she is emphasizing. Belle learns, as we all need to, that true beauty is not just what is on the outside but even more what is within. FAVORITE QUOTES: "Everything is beautiful in its own way, ma Belle, even if you have to look hard to find it. ""The memory of being unhappy has the power to hurt us long after the fact. ""And happiness, once found, is hard to give up. ""Love is many things, ma Belle. And the face it wears is not always what we expect. That's one of the things that makes it wonderful. ""True love never has just one face, does it? It must always have two, or it isn't true love at all." Bleh! Just another insipid retelling of Beauty and the Beast that reads amateurishly plotted & characterised, with the additional aggravation that Dokey is unashamedly trying to reproduce Robin McKinley's Beauty, without a drop of the latter's charm. Don't bother with this copycat book, is what I'd recommend to those checking it up to see if it might be their thing. You'll be best served going for McKinley's, or if you crave something like that story, with the same plot but different enough to satisfy, then go for T. Kingfisher's Bryony and Roses. It's just like McKinley's retelling, with a dash more humour and better developed. I've always loved the story of "Beauty and the Beast". Probably from watching the Disney movie when I was really young(Belle was my favorite Disney princess). So I obviously had some high hopes for it. I can't say that I absouletly loved it, but like any fairy tale lover, the happy ending had me smiling. Quick Overview: Belle feels like her name is a lie. One that you can see quite plainly when you look at her face. Belle means Beautiful and that is a word that describes her sisters, not her. Her sisters Celeste and April are Beautiful with a capital B. Belle knows that the old saying "Beauty is in the eye of the beholder" doesn't really ring true. Because isn't Beauty meant to be obvious? Is it really Beauty if you have to go looking for it? Belle must learn though, that where Beauty really comes from is the heart. When one can't use their eyes, it's the heart they see Beauty in. Alright I know it sounds kinda chessy(that's because it kinda is), but Cameron Dokey does a much better job of explaining this stuff than my short blurb. At first I thought I'd have to read about a self-pitying girl who spends her time complaining about how she isn't as pretty as her sisters, but Belle tells it more as fact rather than with jealousy. Instead Belle just decides to hang in back where she can't be compared to her sisters (having two other sisters myself I can tell you that people actaully do this a lot). I really liked that the two sisters have opposite types of beauty. People relate it too much to a certain set of traits when beauty really has infinite meanings. It was also nice to see that the "Beauty" of the story wasn't gorgeous. I always thought that it wasn't fair that the Beast was loved by this beautiful girl. He didn't have to go and look into his heart or anything. He had a pretty sweet deal if you ask me. It was very satisfying to see that it was different in this version.As most of Dokey's books in this series the first half is a little slow because it's setting up the backstory and ground work for the climax, but I never got bored. Just a little restless. I always feel like it wraps up too fast in the end and I would've liked to see more of the Beast. He doesn't show up until the second half which I think was a little unfair. And I just can't write this without saying that I hated the fact that the line "Oh, my love" was used in here. I'm sorry but that is just one of my peeves. I HATE that line. There's no getting past it. Other than the fact that the end was a bit too fast and, okay, maybe a bit cheesy(it's a fairy tale though) I really enjoyed reading about Belle and Dokey does a really good job of expressing her ideas. Although I didn't love it, it was a very nice take on the old fairy tale. I'm having a little fairy tale phase here. Bear with me. Not very original, took many pages right out of "Beauty" by Robin McKinley. Did really like the family theme. Appreciated that the mother was still alive. Loved that they came together in the country like they never had in the city (and knew it, and appreciated it). The Heartwood tree part was sort of original, but also sort of confusing. The story just wasn't knit together very well. The ending was really pretty lame--the tale of why the beast was The Beast just wasn't really very convincing. Grand-pere Alphonse was sort of superfluous--great potential as a character, but not fleshed out or used all that well. Not a bad book, nothing objectionable at all, just not that special either. 3.5/5Love is many things, ma Belle . And the face it wears is not always what we expect.That's right, ANOTHER Beauty and the Beast retelling. Heyyy, I'm nothing if not predictable. This is also the first Cameron Dokey book for me. I enjoyed it quite a lot. She's not reinventing the wheel with this one. Belle is, for the most part, a very straightforward retelling. I really enjoyed Belle's voice. I appreciated the amount of time Dokey concentrated on Belle and her family. Honestly, I would've loved this, had Dokey given the same amount of attention to Belle and the Beast in the second half of the book. A very basic retelling of Beauty and the Beast. It felt like the Cliff Notes version, skimming over the whole falling in love thing. Could've done that part better. Halfway through reading this, I realized I was halfway through the book and had yet to meet the Beast. That in itself wouldn't have been a problem if I had liked Belle herself at all.However, early on, Dokey sets this up as a tale about Belle being Not As Pretty as her sisters and her Issues With That (god, why the hell are heroines clearly described as beautiful always considered "plain"?). This device was gross to me for a couple of reasons. One, she's described as "plain", but evidence is to the contrary because the actual description of her is of a pretty girl. Two, she decides (without actually confronting her mother or anyone else she thinks sees her "plainness") that she must be so out of tune with her name that she needs to never go out into society ever. Because it's not like plain girls would like social functions. After all, being plain must be like being a social outcast.Oh, and three? Because then Belle - you know the heroine? The one I'm supposed to think is strong and interesting? Spends over half the book thinking about how pretty she is or isn't. Which, I'll put this out there, is really boring. If I wanted to read that book, I'd read an ugly ducking romance novel. At least there, I'd meet the hero in the first ten pages.So, five hundred pages later, they all move out to the country. Instead of being interesting, Dokey decided to say that Belle can carve. She's got a magical carving ability instead of a personality. About 80% of the way through the book (I was reading on Kindle), we finally meet the Beast.And this is where the book went from boring to kind of surreal. Because as a kid I read Robin McKinley's version of "Beauty: A Retelling..." alot, so when certain scenes began reading as familiar, I went with my gut.Whole scenes, whole pieces of dialogue are essentially cut and pasted from Robin McKinley's book. Except where in that one they'd been used to show an at first acrimonious, then slowly becoming warm, then slowly becoming love in this book they're just... there.For example, in Beauty, the two bond over reading books. I think she reads to him? Because his claws make it hard. In this one, he shows her his claws and says he likes reading. Later, Dokey says they have conversations about books, but we never hear them, since she thinks we should just believe they're falling in love without any proof. This is, after all their love story. Why would we want it shown instead of told?Instead of asking her to marry him, the Beast asks her to look at him for five seconds. Interesting! However... not really. She's so desperate to escape, but she doesn't try, not even once. At least in "Beauty" as she grew to love him, the idea of saying she couldn't marry him became painful to Belle. In "Belle", we don't have an idea of what their relationship is like. As she refuses to even try to look at him, it becomes clear that that's a metaphor for how Dokey sees their relationship.She shouldn't have to try to write it for us. We need to take it on faith that it's there.Oh, also, the whole carving thing was one long, unshot Checkov's Gun. It had absolutely nothing to do with the conclusion.It must be hard to write a version of Beauty and the Beast after Robin McKinley did it. However, this one decided to either copy or do the opposite of whatever McKinley did. Instead of making this one a unique, interesting book, it just left me with a craving for the original. When I started this book, I smiled at reading the back cover. I believe the Heartwood or a tree similar to its myth featured in another myth in another book of the "Once Upon a Time" series. I don't recall which one it was - a prince carved a flute from it, I believe, while his brother carved a spear or something... Anyway, back to this book. I decided to pre-order it because I rather liked the books I've read of this series so far, and Beauty and the Beast is one of my liked stories. (Admittedly, I know it only in the Disney version.) I liked the writing - it was clear without being too flowery. However, reading it, I got a sense of deja-vu from Robin McKinley's Beauty: A Retelling of the story of Beauty and the Beast. Maybe it's due to my ignorance of the original tale - was Beauty's/Belle's father originally a ship owner/merchant and she has two sisters? Were they doomed to financial ruin and that's why Belle's father got driven into a bargain with the Beast (indirectly as it may be)? If that's true, then I don't have much to complain of the deja-vu feel.A friend mentioned the love part felt rushed. I agreed, as I felt it also felt rushed in another version of Beauty and the Beast in this series. I wish we were given more information of how they passed the time getting to know each other prior to the lake incident. I liked the idea of her disappearing because she was "out of the birth order" while in line for a while - I wish something had been done more about that, since it was really intriguing. Nothing like true love to make a Fairytale story magical. The book doesn't start that way but the beginning is just supposed to lead up to that. It starts with Belle saying how beauty is not -as some people would have you believe- in the eye of the beholder. Her two older sisters are considered beauties but for different reasons. The oldest is the dark haired mysterious type and the second is blond with the sunshine just bursting out of her. It's good to see the author show that beauty isn't restricted. However I don't see why they have to have unique eye colors. Green isn't really that common though you'd think so by how much people claim they have it. She goes on to say how she doesn't think that she had any self-pity when she was younger because she isn't as beautiful as her sisters. I think she did. She isn't her name so it feels like it's a lie and that is what she doesn't like. People expect her to look beautiful and she doesn't. Belle comes to accept her looks just as they are when she grows older. Her relationship with her sisters strengthens when things start to go wrong. And you see that Belle's sisters are more than just their pretty faces. The magic of the story doesn't take place until the last quarter of the book. In fact I don't see where the beast will come from until half the book is through. You don't see a lot of the beast at all until near the end. These are what kept me from giving it 5 stars. That, and that it was a bit cheesy. But that doesn't bother me so much. Its stays pretty true to the tale except for the fact that Belle isn't beautiful. Belle is a straight-shooting character so I like it. This is a retelling of Beauty and the Beast. And by retelling I mean that the father isn't dumb, and the author replaces the stolen rose with an accidentally fallen tree branch.I feel like this is the book you give to middle school/high school students to teach them about patterns and oppositions in writing. No subtlety. Also, it has the classic mistake that most MODERN YA authors try to avoid- you know nothing about the prince, and you can't tell that the heroine is in love with him, or vice versa, until the author tells you. No hint, no plot build up- kind of like the way Cinderella and Prince Charming end up together in the Disney movie. She's pretty, they dance, and then there is an easily resolved footwear issue. Well, that stupid tree branch was the footwear issue of this book. M'kay... not very far into this book and already I'm super annoyed with Belle. If she mentions one more time how Beautiful her sisters are and how plain she is... I just might scream. Update: I finished this book and then kept thinking "I should go finish reading Belle"... only to remember I was done. The first half of this book went on and on. The second half was so rushed! I could understand and feel more for the relationship between the father and daughter than I could between the girl and the beast! It was frustrating. One moment she was scared to death of him and then she was in love on the next page. There was no build. No anticipation. Just a flat, frustrating end. It would be hard for anyone who's ready "Beauty" by Robin McKinley to not compare the two books. In my opinion, "Beauty" was the far better story, though this book was not without its merits. Still, the comparisons are difficult to ignore. In both stories, the "Beauty" character is the plain (or plainer) daughter, with two older sisters who are heart-stoppingly beautiful - or Beautiful, as differentiated in this book. They are daughters of a merchant who loses his money, and so the families are forced away from the city to live in a town next to an enchanted wood. Of course, there's the inevitable debt owed the Beast, which Beauty must repay.I actually enjoy retellings of familiar stories, and I try to rate each on its own merits. However, this story had SO much in common with "Beauty" that it was impossible for me to not mentally compare. "Belle" does bring some new elements to the table, to give credit where it is due. In "Belle" there is no rose; the story device centers around a Heartwood Tree. Belle is gifted at wood carving, and she must find the truth within the tree - and in Beast - in order to set him free.That said, there are many other elements that fell flat, or weren't as successful. I always pay attention to supporting characters in books, because I think they help flush out a tale and turns a book into a world of its own. In "Belle" the supporting characters were hit-and-miss. I did enjoy the parents - particularly the father. I felt for Belle when she thought her mother pitied her for not being as beautiful. However, Belle has two sisters who are mentioned quite frequently but not entirely well-developed. Of the two sisters, Celeste is a bit more three-dimensional, as you learn she has a sharp tongue when she's nervous or upset. You also learn that she does genuinely care for Belle and her feelings, underneath this occasionally brash exterior. April, the middle daughter is...there on occasion. If I had to describe her personality or characteristics, I really couldn't give one. I could hardly describe her, save to say that she has hair that seems to glow in the dark. In "Beauty" there are two sisters, as well, but both have distinguishable personalities and are fully formed characters in their own right. Again, it's hard to avoid making this comparison.Of course, the main crux of the books has to do with Beauty and the Beast. It's the purpose behind the story, after all. "A Retelling of 'Beauty and the Beast'" is written on the cover. And yet...this is where the story really falls flat for me. And, given that the whole plot of "Belle" is to retell the story of Beauty AND THE BEAST, it is a deficiency that is both glaring and unpardonable, in my opinion. I could forgive rather forgettable secondary characters. I cannot quite forgive a forgettable - or largely forgotten - Beast.I feel like Cameron Dokey was inspired by Robin McKinley's story, but in this respect, she rather missed the point of what made "Beauty" such a wonderful retelling. "Beauty" delves quite deeply into the character of Beauty herself - her family life, what brings her to the enchanted wood, what causes her to decide to pay her father's debt to the Beast. In that way, you really get drawn into the story and so you empathize with the other characters when they grieve over having to let her go off to an uncertain fate. However, "Beauty" then spends a significant amount of time describing Beauty's interactions with the Beast, how she comes to slowly care for him, why he lets her go even at the risk of his own life, and why she has the realization at the end that she truly loves him. And that epiphany really IS an important moment in any story of "Beauty and the Beast" as it is (in my experience with retellings of the story) rather the entire point. "Belle" also spends a significant amount of time on Belle's life before the introduction of the Beast. My complaint is that the Beast is rather forgotten for almost all of it. Other than a brief mention of "a monster in the Wood" there is no mention of the Beast at all until page 123 (of 204). Beauty herself does not meet the Beast until page 143. That does not leave much time - only 61 pages - to explain how Belle comes to care for him, why she falls in love with him, why he falls in love with her, why he finally decides to let her go, and why she returns to him. Of course, entire stories can be told in 61 pages, if done properly. However, in this case, Cameron Dokey drops the ball, in my opinion. How does Belle come to care for the Beast? They have a lovely scene in a boat, but that's pretty much it. Why does she fall in love with him? Well...they have a lovely scene in a boat, but that's pretty much it. Why does he fall in love with her? Not really explored. She meets him on page 143 and leaves him again on page 185. From the moment Belle meets the Beast, the story HURTLES towards its inevitable - and well-known - conclusion, rather than taking the time to let the ending develop naturally. They fall in love because the story says they fall in love. Period, end of story, nothing else to see here, folks!It is a disappointing let-down. If I read a story of Beauty and the Beast, it's because I'm interested primarily in THEIR story - the story of Beauty and the Beast. If the central message is that beauty can be found below the surface, even in the most unlikely of places, then I want to be able to believe that message. I want to know why Beauty falls in love with such a Beast, and I want to know how the Beast is changed by Beauty, and not just in form and figure. Cameron Dokey completely dropped the ball in this respect. It is almost as if the Beast, and the story of Beauty and the Beast, is a secondary story, an afterthought to the story Cameron Dokey REALLY wanted to tell, about the nature of beauty versus Beauty. I don't mind an exploration of the merits (or lack thereof) of shiny new buckles on shoes, as long as the CENTRAL story is told, and in this case, it was not. It is never even really explained why Belle cannot look the Beast in the eyes - this tale's re-imagining of the typical nightly proposal. I was intrigued that this would be what it would take to break the spell, but Belle simply cannot do it. Sadly, it is never explained why. (It is explained why her father cannot look the Beast in the eyes to the count of five, but not Belle.) Although she is shown as strong and brave, she cannot look him in the eye and flatly refuses to try. However, it is never explained why, and this makes her unwillingness to do so frustrating and annoying, rather than sympathetic - a demonstration of the growth she must take in the book. "Belle" is not a bad story, but it is only half the story it could have been. If page count was an issue, Cameron Dokey should have been more prudent with the first 120-so-odd pages. Of course, I want background. I want to know who the character of Belle is...but I also want to know the character of the Beast, and I don't think you get that chance, in this book.If Belle is the only character who really interests you in the story of Beauty and the Beast, then "Belle" is a good story for you. It is even aptly titled, as Belle is really the only character the author develops in this book. If you want an imaginative re-telling of Beauty and the Beast that gives you a good sense of who the two charactes are separately and together, why they fall in love, and why their love story MATTERS, then I recommend reading "Beauty" by Robin McKinley. It is a fantastic story, of which this is only a pale imitation. I love Beauty and the Beast! The movie is coming out this month, and I can’t wait to watch it! When I found out about this retelling, I was so eager to get my hands on it! Huge thanks to Simon Pulse for giving me a copy free of charge. (Anything related to Beauty and the Beast, I need. Yes, I’m a bit obsessed ) Okay, to be honest, I read Robin McKinley’s retelling of Beauty and the Beast, so I was expecting a bit more from this retelling. Belle is a fun read but isn’t wholly original. Everything seems to remind me of McKinley’s “beauty”! It also took a long time for the Beast to be introduced. (What happened to “Beauty and the Beast?) But, nevertheless, I still enjoyed Belle. I love that the mother in Belle doesn’t die and that’s a nice twist i enjoyed. Also, I literally read the entire book in one setting and was absolutely hooked. I love that I was able to hold on till the end. I loved the first half of the book! I liked this book a lot. It wasn't great but it was enjoyable. Good: The characters were lovable and original. I loved the beginning, I thought it was a lovely start and had just enough background information. It was thoroughly engaging. I like Cameron Dokey's style, I find it humorous and endearing. Bad:It was a bit too much like Robin McKinley's Beauty. There were some parts that I wished were changed up a bit. Dokey has the talent, she has written some very inventive stories. I just wished she had used some of that creativity with this story. As with every hopeless romantic book-lover, I just wanted Belle and the Beast's love-finding to grow, to last longer. I was disappointed at how the story progressed. It was as if they wrote this beautiful long beginning, describing everything, setting up this lovely story, then: oops, ran out of space, 'they fall in love and live happily ever after the end.' The characters were a lovely match, both just stubborn enough to keep things interesting. I really wish there had been more development between the two. This is by far, my favorite fairy tale ever. I love nearly every retelling of it. (The exception being Robin McKinley's Rose Daughter, which I strongly disliked). I adore this fairy tale so much! I can't get enough of it. I enjoyed reading it despite all the 'bad'. Belle is not Beautiful, as she learns on the day she steps between Celestial Heavens and April Dawn, her two sisters, and disappears. It is a lesson she can’t unlearn. Not as she discovers her gift for finding the heart of the wood she carves, or as her family stumbles into poverty, or as she enters the castle with the gate of two hands stretched out toward one another. But there is another lesson here. And one she MUST learn before it is too late .My favorite aspect of this book was the way it stayed true to the heart of the original fairytale. I had read a number of interpretations of the fairy tale and this interpretation was good but was a drag at some points. A retelling of one of my favorite stories, with a few twists that make it more interesting and an engaging writing style that makes the pages fly by. * Reviewed by Frog for North of Normal Book ReviewsMore like a dissertation on beauty than a love storyAs I continue my Beauty and the Beast mission to read every adaptation I can find, I chose BELLE next owing to its beautiful cover and placement on the Barnes and Noble Beauty and the Beast table.BELLE by Cameron Dokey is a smartly written study of Belle in a short, predictable, and not very heartfelt adaptation of the Beauty and the Beast tale. This is a historical teen novel set in a mythical walled city outside a dark wood.Annabelle is obsessed with beauty and has been ever since she was twelve and stood unseen next to her two beautiful sisters. The first 50 pages of this book is a study of the word beauty and what it means to Belle as she ages into her teen years. Belle believes she's too ugly to stand beside her sisters in public, and so she shuns events in favor of carving wood. When her father's shipping business suffers a huge loss, her family must move from the expensive city and into a quaint house in the countryside, next to a dark wood, where legend holds lives a Beast who protects a magical flowering tree. At about the 70% mark in the book, Beauty finally meets Beast for a very short, very shallow courtship that progresses in the most predictable way, holding true to the classic beauty and the beast story. This was a slow-paced, predictable story steeped in atmosphere. There is no deep point of view here, and no opportunity to really invest in any love story, though Belle is likeable enough. I honestly couldn't tell if the beast liked beauty or not. He didn't seem terrible taken with her. The Beast remained mysterious and showed no real character change in this story. In a way, this is more of a lyrical tale than it is focused on plot.To date, this has been my least favorite retelling of the classic Beauty and the Beast story. I skimmed most of it, but I did want to finish the book, which ended with a nice, though predictable epilogue. The writing gets an A+ but the love story earns an F for forgettable.Beauty and the Beast fans may enjoy this enchanting short, which hold fairly true to the original fairy tale. I'll definitely hang on to this book and not only for its beautiful cover--there were some beautiful sentences I highlighted as well. The is no real romance here. It's more of a meeting of two minds. The language is tame, and the violence is nil. This book is appropriate for ages 10 and up. Bought this at Target, all excited to read a new retelling of Beauty and the Beast, only to find out, I read it in Cameron Dokey's three story collection from Scholastic almost four years ago. The upside, I got rid of that book because I didn't like the other two stories. At least I don't have double copies! I was pleasantly surprised with this retelling! I usually struggle with enjoying retellings because they're so predictable or they are trying too hard to be different; however, this book was an excellent mixture of the original fairytale with original aspects from the author. I loved the heart-tree story and incorporation instead of a rose -- I thought that was beautifully written and extremely interesting to read! This book is an easy read. Quick, simple, well-written, and a strong message. I would assign this to my students to read! Great for young readers! So I really enjoy this series, most of the time. Its official name is "Once Upon A Time" but I usually just refer to it as the fairy tale series. It's written by a bunch of authors, but I think that Cameron Dokey is one of the better ones, and she usually delivers. This time... she sort of delivered?Belle is obviously the Beauty and the Beast retelling, and it starts really well. To begin with, Belle gets along really well with her sisters; there's no more than the average sisterly rivalry, and that largely dissipates once they move out to the woods. Dokey establishes Belle's family and their life, describes Belle's largest conflict, and sets up the entire world, and does it so well. It's all essentially prequel to what one would think is the story, but it's riveting.And then we get to the actual story, where Belle meets the Beast, and the story falls flat.It's so sad, it really is. I love Belle's voice, I love her family, I love all the setup, but there's just not enough there of her relationship with the Beast. I don't believe that she fell in love with him, because I didn't see it happen. Dokey just sort of glossed over the entire time at the castle, expanding on only about three different incidents. It just didn't seem believable that Belle would fall in love with the Beast when we-- both us, and the readers-- know nothing about him.Augh. It's like Dokey spent all this time and effort on the opening of the book and then realized that she had a week before the deadline and wrote the rest in a caffiene-fueled rush. But the beginning really is good. I am a huge fan of fairy tales retold, and Cameron Dokey is one of the authors I enjoy reading in this series. However, this one fell a little short of my expectations, at least as far as the storyline was concerned. 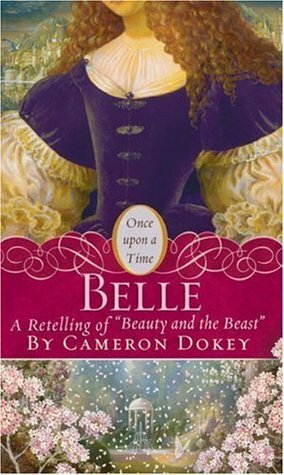 I thought Dokey's approach to the fairy tale was engaging, and Belle's reflections on Beauty, with a capital B, thought-provoking. I also liked that there were no evil, ugly step-family members, or un-step-family members, or other individuals who are there for readers to dislike, as tend to be included among the characters in stories such as this, whether or not they were there originally. However, I felt that the back story and build-up preceding the classic fairy tale was a bit drawn out, leaving the fairy tale to be wrapped up rather quickly, with little further development of characters or plot. I would have liked to get to know the Beast as well as I felt I knew Belle and her sisters, Celeste and April. But all I got was a short summary of Belle's frustrating time at the Beast's castle, unable to fulfill her role there, then suddenly pining for him when she returned to her family. There was no real evidence for me that the relationship between Belle and the Beast had grown into one of love. It was just all of a sudden that way. Of course, that could have been the point. I love fairy tale retellings and Beauty and the Beast is my favorite fairy tale so I'm always curious about retellings about it. I've read most of the books in the Once Upon a Time series but I felt like they weren't really for me. I don't know why, maybe because they were trying to keep the books short, I felt like that stories weren't fully developed. The same was true for this one.The beginning reminded me of Robin McKinley's Beauty: A Retelling of the Story of Beauty and the Beast because Belle has two sisters that are both beautiful while she is not. Although in this retelling, Belle focused on it more. It was a huge problem for her that she was named Belle (which means Beauty) but she wasn't beautiful.Cameron Dokey deviated from the usual story by coming up with the Heartwood Tree. Instead of a rose, Belle's father took home a branch from the Heartwood Tree.Overall, the book was just okay for me. I would've probably liked it better if the story was more developed. I didn't really feel that the Beast and Belle connected during the short time that they were together. Cameron Dokey - Cameron Dokey is an American author living in Seattle, Washington. She has a collection of over 50 old sci-fi and horror films. Cameron was born in the Central Valley of California. Cameron grew up reading classical literature and mythology, perhaps due to her father, Richard, being a teacher of Philosophy, Creative Writing, and Western Literature. Cameron has one husband and three cats, and is the author of over a dozen young adult novels. Her favorite read is J.R.R. Tolkien's trilogy, "The Lord of the Rings." Her favorite TV show is "Buffy the Vampire Slayer. "When she's not writing, Cameron likes to work in the garden and is learning to quilt.